As it’s a new week, I’ve taken the weekly chart in order to provide a different perspective on our trading for this week. As I mentioned last week, my long term trade was stopped out, so I am now looking to re-enter the market at some point, and as a general rule, I use the weekly charts for direction and the daily charts for entry and exit points. 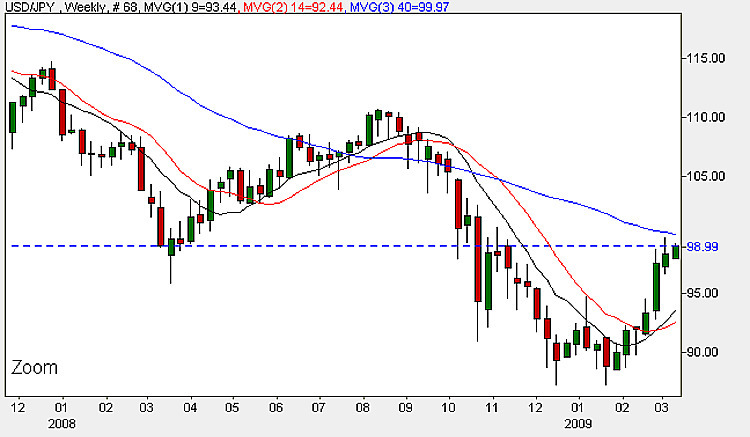 So what is the weekly chart for the dollar yen telling us at the moment. Well firstly, we have had three weeks of gains so it would not be a surprise to see a reversal this week with some profit taking following the strong move upwards, a view which might be confirmed once we start to approach the resistance level directly ahead in the $99 region. Indeed if we look at last week’s candle, the highest price of the week bounced off this area in a failed attempt to move through and on to the next target level. Whilst this is only a small area of resistance, it is there nonetheless, and we need to keep this in mind. Now the final issue is the 40 week moving average which is sitting just ahead, and again this could cause a reaction if prices fail to penetrate this average. So, having considered all the various aspects in detail, what are my thoughts – well in simple terms I would take a wait and see approach at the moment, as once we are clear this level, then there little short term resistance ahead, with the prospect of a move up through the $100 and beyond. My suggestion ( and my own decision) is therefore to wait and see – if prices do move above the current level, and cross the 40 week moving average, then I will start to look at an entry in the daily chart, buying on any short term reversal or dip. As always all the other news is covered for you on the live economic calendar, with the live news feed providing the latest information. The fundamental news releases are also covered daily in the latest currency news video which is updated three times a day. Finally if you are looking for help in finding or choosing an ECN broker, please just follow the link for more details. All the latest prices are now available on the live currency charts.